On December 4th and 5th, the University of Washington's mock trial program hosted its first invitational tournament, the Emerald City Open. 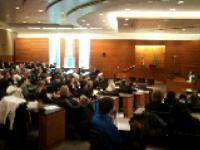 20 teams from 11 universities travelled to the UW School of Law for an intense weekend of competition. At the end of four rounds, Bowling Green State University, the team that travelled the farthest, emerged as tournament champions. A special thanks to members of the Law School administration, including Dean Testy, Dean Hotchkiss, Kim Eckstein, and Marnae Schmidt, and the Moot Court Honor Board members for making this tournament possible. We'd also like to thank all of the judges, attorneys and law students who gave up their weekends to score the rounds. Thank you to Steven Taylor, Michael Harden, Elizabeth Coltrera, and Zac Hill for all their work in the tab room, judges' meetings, and behind the scenes. Finally, a very special thanks to UW 3L Carmen Wong and tournament director Taylor Larson for their tireless efforts to make the inaugural event such a success. In addition to hosting, two teams from UWMT competed in the tournament. Team 1278 made a strong showing in its first invitational of the season, with close rounds against Fresno State, Portland and Eastern Washington to finish with 3 ballots. Team 1277 placed 2nd with a 6-2 record, its second Top-2 finish in as many tournaments. Complete results can be found on the Emerald City Open page.